I often talk about making Django scale but what does it actually mean? It means getting consistent performance regardless of the amount of data. Things You Must Know About Django admin As Your App Gets Bigger - Included an overview of built-in options to optimize for larger tables. How to Add Custom Action Buttons to Django Admin - Explained how to make Django admin more suitable for operations. How to turn Django Admin into a lightweight dashboard - Showed how to add custom pages to the admin with fancy graphs and chart. This was our first dashboard (and we still use it!). 5 ways to make Django Admin safer - Described different measures we took to make our admin more secure (this one also inspired a package). Scaling Django Admin Date Hierarchy - Identified issues with the date hierarchy and suggested ways to alter the admin behavior to better handle large tables (we also turned it into a package!). Django Admin Range-Based Date Hierarchy - Looked at the queries generated by the date hierarchy and made them much faster. I'm especially proud of this one because I managed to get it into Django 2.1. How to add a text filter to Django Admin - We added a new type of filter to save some time when generating list filters. Count is taking so much time! Django spent 781ms out of 786ms just to count the rows in the table. That's ~99.4% of the time, just for the paginator! For reference, the actual query used to fetch the data took only 2.10ms. The reason it's much quicker is that it only needs to fetch one page (notice the LIMIT 100). Making something scale is all about eliminating operations that work on the entire dataset. The paginator has to count the rows to determine how many pages there are. This forces every single page in the admin to scan the entire table. As the table grows in size this query takes longer and longer to execute. The size of the table has a direct impact on the load time of a single page and this is exactly what we want to avoid. Django ModelAdmin provides a way to override the paginator. Our initial thought was to implement an entirely different type of paginator - one that doesn't calculate the number of pages, but only shows links to the previous and next pages. Unfortunately, the paginator is embedded deep into Django admin - Django uses partial templates to render the paginator. This makes it difficult to create a paginator that doesn't count pages. This is where the horror happens. 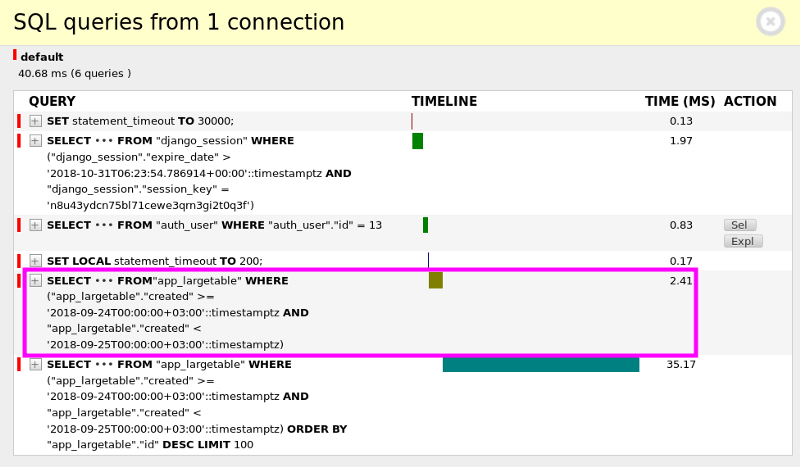 Django counts the rows in the queryset (or the object list) and caches the result. If we want to eliminate the count this is where we need to start. Paginator that does not count the rows in the table. Wow! With the dumb paginator the page now loads in only 4ms. This is impressive but how does the UI looks like? We made the paginator think there are 9999999999 results so this is what it shows. Clicking on a page that doesn't exist will open an empty list view. We saw that we can provide a custom pagination and eliminate the count. We also know that Django is very attached to this specific paginator template so we can't easily replace it. At this point it's obvious that if we don't want to work too hard and alter Django's templates, we need to make a compromise. A compromise can be made either in the UI or in accuracy. I personally don't like to sacrifice accuracy so fast so I tend to make compromises in the UI. Especially in internal projects such as ones implemented with Django admin. Paginator that enforces a timeout on the count operation. We let the original paginator count the rows. If the count takes longer than 200ms, the database will kill the query, an OperationError will be raised and we return the fake value. If the count takes less than 200ms it will work as usual. 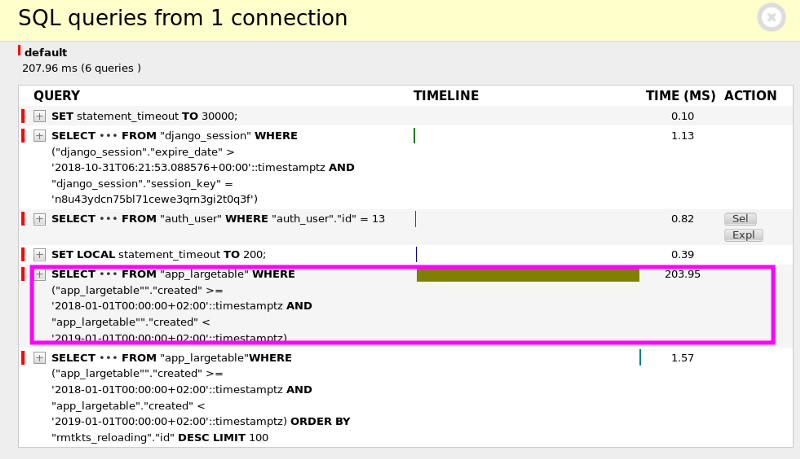 Query took longer than 200ms and was killed. Query finished in under 200ms and was not killed. Count took only 2.41ms. It was not killed and we got the regular "paginator" - exactly what we wanted! The complete code for TimeLimitedPaginator can be found in this gist. Estimate the number of rows based on the database execution plan - in Django 2.1 there is even a new explain function on QuerySet. This approach is very inaccurate, especially with complicated predicates, and might yield unexpected results. Cache the number of rows - the boring and unimaginative solution. As always with a solution that involves caching, you need to decide when to invalidate the cache which is a problem of it's own. Completely replace Django's paginator - replacing templates and possibly making adjustments to the change list itself. I went down this road initially but gave up when I realized it will be difficult to make this "plug and play". I do believe that a proper solution should let users replace the pagination implementation to something like cursor pagination (pagination that does not need to evaluate the entire dataset).